In the heart of historic downtown Norfolk, the Monticello Arcade offers a taste of style and beauty unique to the area. The Monticello Arcade is a historic shopping arcade located in Norfolk, Virginia. Built in 1907, the Arcade is open to retail and commercial use, and serves as a thoroughfare for the public during business hours. Listed on the National Register of Historic Places in 1975, the Monticello Arcade is one of Virginia's eminent architectural achievements of the last century and a highlight of downtown Norfolk's business district. 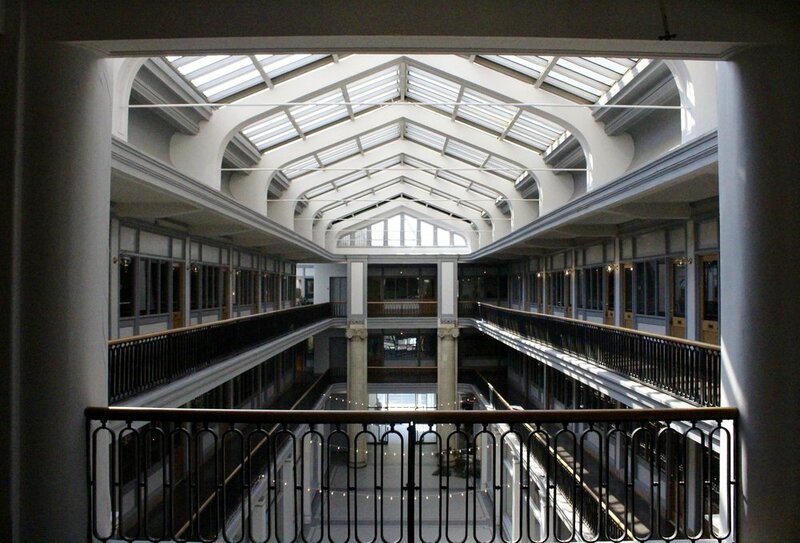 The Monticello Arcade was constructed in 1907 by Neff and Thompson Architects for Percy S. Stephenson on land leased from the Selden Grandy Estate in downtown Norfolk. Much attention was drawn to the area that year by the Jamestown Exhibition held in Norfolk in 1907. One of only two arcades in Virginia (the other being the Selden Arcade directly across the street), the Monticello Arcade is a three-story, Beaux-Arts style reinforced-steel concrete frame building faced in molded and polychromed terra-cotta. Business boomed in the Arcade as downtown Norfolk’s commercial area expanded until the Great Depression, at which time Monticello Arcade Company, Inc. filed for bankruptcy and the building returned to the Grandy Estate. 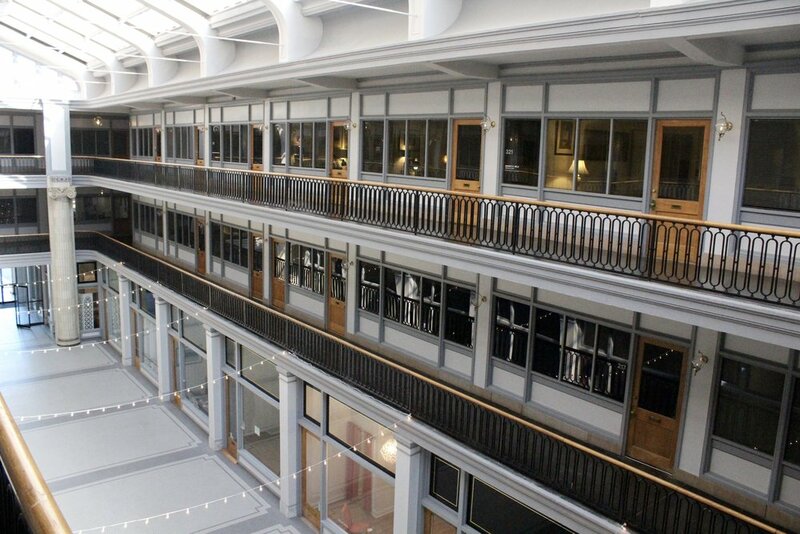 The idea of an enclosed market area can be traced back at least to the Greek stoa, and hence it is not surprising that the scheme should have been adapted to American commercial use as early as 1828 in the Greek-Revival Providence, Rhode Island Arcade. The population of Norfolk grew to 100,000 by the early-twentieth century and touched off a land boom. Many small companies capitalized on the rapid development of fashionable residential districts such as Ghent and the resort areas in nearby Princess Anne County. The Arcade survived the remainder of the Depression in the hands of its new owners and went on to prosper in postwar Norfolk. Business in the downtown area began to suffer in the early 1960s, and during that time the Monticello Arcade began to deteriorate as revenues declined. By the 1970’s, the Arcade was in poor condition with only a few remaining tenants. Threat of condemnation loomed until 1975, when the building attained landmark status. In 1976, management of the Arcade was taken over by the newly-created Monticello Arcade Limited Partnership. General partners Hartwell & Wiley Gary undertook many major renovations. By the early 1980s downtown Norfolk was significantly restored, resulting in recovery of Arcade business. Today the Monticello Arcade remains in the heart of Norfolk's business and retail district. The building forms a protected pedestrian passageway between City Hall Avenue and Plume Street closing the vista down Monticello Avenue in Downtown Norfolk. Both the facades are seven bays in length and are composed of eight two-story Ionic order columns, crowned with an elaborate cornice and an attic story above. The first and second stories are divided by simple recessed-panels adorned with mounted bas-relief paterae and lion busts. The layout consists of a longitudinal building open to the roof by a large skylight running the length of the mall, with a two-story archway entrance at the central bay at each end. Shops and offices line the mall on each of the three levels. Just inside both entrances are staircases leading to the upper floors. The interior, echoing many of the embellishments of the exterior, remains predominantly as it was initially designed. A pair of elaborate, engaged Ionic columns with angle-volutes and delicately modeled female masks frames each entry. These carry blocks of enriched entablature which formerly, according to early photographs, supported engaged spheres which have since been removed. The remaining detail is strikingly crisp, and the original gallery railings with their delicate arcaded balustrades give a pleasing visual unity to the interior. The building is lit principally by natural light from the notable skylight above. 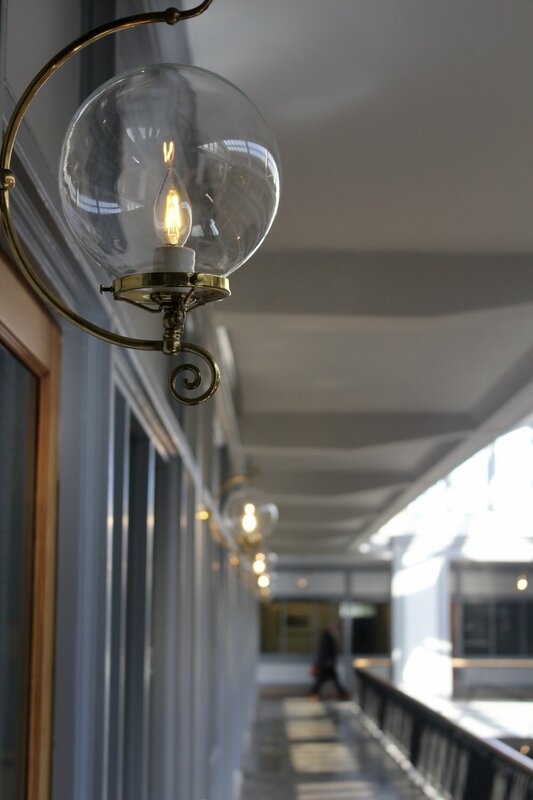 Additionally, the second and third floor bay fronts bear lantern-style globe fixtures. Early photographs in the Mann Collection of the Virginia State Library depict an elegantly appointed building, well-designed to attract Norfolk's patrons. The early tenants of the Arcade were representative of Norfolk’s economic life. On the lower level were milliners, shoe stores, cafes, tailors, and other small businesses. The upper floors were occupied mainly by insurance agents, law firms, and real estate companies. Please contact Cavalier Land for information on leasing the Arcade.